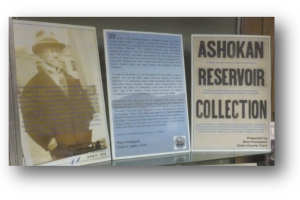 The Ulster County Clerk’s Office is pleased to collaborate with the Olive Free Library, and bring to you a piece of the history behind the construction of the Ashokan Reservoir. The Ashokan Reservoir was constructed between the years of 1905 and 1916 for the sole purpose of providing New York City with fresh water. As a result of this monumental project, numerous records were produced. These records document the transfer of land from the local inhabitants and also put the viewer back in the court room listening to first person testimony when the claimants were suing the Board of Water Supply for additional compensation. The Olive Free Library is open Monday-Tuesday 10am-8pm, Wednesday-Thursday 1pm-8pm, Friday 1pm-5pm, and Saturday 10am-4pm. Please call the library at (845) 657-2482 for more information.